I found this interesting for a couple of reasons. Firstly, it struck me that someone would be afraid to read my book. I never expect friends to read my book. It’s a lesson I learned early on. It’s a burden to place on your friends, and puts them in an awkward position. Some people will read it, and some won’t. For many reasons. It’s best not to worry about it, and I don’t ask people about it or ask the reason why. But this person volunteered that information, and I found it interesting. Because I thought, what’s to get? I’m writing a story about robots and spaceship racing and a domineering corporate environment. Everyone can take what they want from it. They can read deeply into the themes and subtext, or they can just enjoy a fun space adventure. Because that’s mostly what it is, I think. 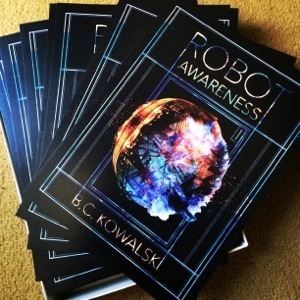 It is not the robots who are becoming aware in this book, it is us who are beginning to understand them. When I read this on my phone I nearly dropped the darned thing. I mean, it took me a while to come to the same understanding through the writing process, but that’s EXACTLY why I named the title what I did. But it also bothered me. Because, I thought, I don’t necessarily want people to think they have to “get” my book. I don’t think reading is about either “getting it” or not. I think it’s about enjoyment, and I think each reader can take from a text what they like. That being said, I really enjoyed receiving a review like this. In fact, I feel like it has made all the time I spent writing my book and editing it and working with a cover designers and editors worth it. That someone could understand what I wanted to say with Robot Awareness is a really great feeling. It’s a special connection, and not one I feel a reader needs to have to understand the book. But I’m glad at least one person did.